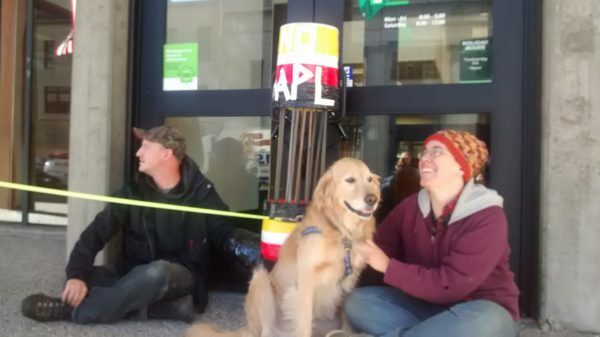 As part of a nationwide effort opposing construction of the fracked-oil Dakota Access Pipeline, two Worcester residents (Jen Burt and Kyle Schulz) this morning locked themselves to the front door of the downtown Worcester branch of TD Bank, a sister company of TD Securities, one of the financial institutions financing the pipeline. Once their locks had been cut, they were arrested. Update: They have been charged with trespassing and disorderly conduct. A December court date has been set.